There’s no doubt about it, tool theft is spiking in the UK – and statistics indicate that 98% of tradespeople are concerned about stolen tools and van theft. And rightfully so. It is estimated a van is broken into every 23 minutes in the UK, and van thefts have tripled in recent years according to the West Midlands Police – with over 6,500 thefts in the last three and a half years. We’ve all heard plenty of stories from fellow tradespeople of tools being nicked from the back of vans whilst out on the job. And if it’s happened to you, you’ll know only too well the repercussions it can have. Stolen tools can mean days, or even weeks of lost work – and are costly to replace. Not to mention the damage done to your van and the costs involved in repairing it. We know this is an obvious one. But all too often people forget to lock their van if they’ve got their hands full unloading or loading tools – or whilst they quickly pop into their local builders’ merchant. If you know that you’re frequently guilty of doing this, then consider getting a slam lock fitted. These automatically lock a van door when it’s slammed shut – to prevent opportunist thieves entering the van when it is briefly left unattended. We all think it won’t happen to us, yet there are plenty of stories of thieves using coat hangers to fish keys through a letterbox. The easiest way for thieves to steal your van is to have the keys – so don’t leave them on display or within easy reach at home or on site. Again, this might be an obvious one. But even just leaving a bag with nothing in it on display could tempt a thief. Even if they get away with nothing, you’ll still be left with a broken window or damaged door and have to deal with the inconvenience and cost of fixing it. If possible, take your tools in from your van overnight. 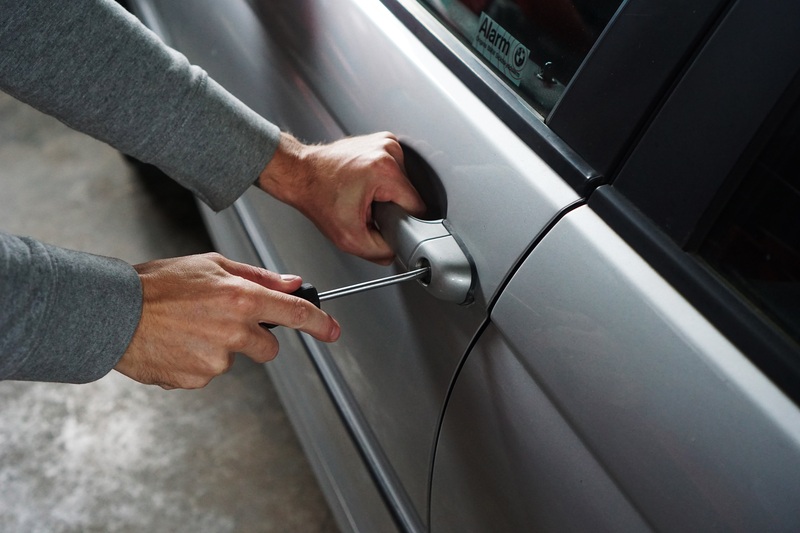 Although this won’t prevent thieves breaking into your van in the first place, it will at least mean they don’t take off with your valuable tools. But if the thought of having to do this daily is already tiring you out, consider getting yourself a lockable, portable chest – such as this one from Stanley, or this wheeled job box from Keter. Whilst it’s best to take expensive tools and equipment out of your van, we realise this isn’t always possible when out and about on a job. A secure storage system will make it much harder for thieves to gain access to your tools – ultimately deterring them – and will give you some piece of mind. Armogard Tuffbank provide a range of heavy-duty boxes, such as a robust van box with reinforced 5-lever deadlocks and anti-drill plates. Van racking is also a good option for keeping your tools secure. The DeWalt TOUGHSYSTEM is quick and easy to install – and is fully adjustable, so can be fitted to any type of van. If you can’t bring your tools in overnight, or will be leaving your van unattended during the day, it’s also a good idea to park in a way that will prevent or deter thieves from getting to your tools. Parking with sliding or rear doors against a wall or sturdy fence will help keep your van safe from the ‘peel and steal’ method – whereby thieves grab the top of the van’s back or side doors with their fingers, and use their bodyweight to pull them down. You should also try to park in a busy, well-lit area – preferably in view of CCTV cameras – where possible. Most people assume that all modern vans have an alarm and engine immobiliser as standard – but that’s not necessarily the case. If you have a cheaper or older van, it’s likely that it will come with neither. You can get a basic system from as little as £30, which will prevent the engine from running unless the correct key has been inserted into the ignition. But we think it is worth investing in a decent alarm system to reduce the chance of break ins and theft altogether. Whilst it won’t prevent your van or tools from being stolen, having comprehensive insurance cover will make life much easier if your van is targeted. Don’t always go for the cheapest third-party cover – sometimes it’s worth paying a little more to save yourself a lot of hassle. Always read your policy small print as well to find out exactly what’s covered, and if there are any special conditions. For example, some insurers require you to have certain alarms fitted in your van, in order for tools stolen from it to be covered by the policy. We’d also recommend keeping an inventory of any tools you carry and marking them. Keep hold of the receipts of more expensive items as well. If the worst should happen, it will make it much easier to make an insurance claim, or reclaim your goods if they are recovered by the police. Sometimes you can take all the right precautions and preventative measures, but there is just nothing you can do to stop a determined thief. If the worst happens, then the first thing you need to do is file a police report – either by calling the non-emergency 101 number or visiting the nearest police station in person. To help police identify your tools if they’re found, and to make the insurance claim process easier, you should provide an itemised list with the make and model of everything taken. It may also be worth taking photographs of the crime scene, both for the police and your insurer. If you need to update your van security and storage solutions, or even if you just need some new tools, then visit your local Real Deals for You Approved Stockist, where you’ll always find great offers on a range of quality products, by quality brands.